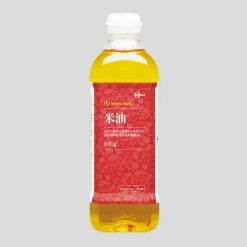 This vegetable cooking oil is born from the husk and germ of brown rice and made using domestically produced materials. Can be used for making fried foods and stir-fries, and also goes perfectly with dressings and mayonnaise. Rice bran oil has a smoothness to it, causes little “oil drunkenness,” and is fairly easily digested. Our rice bran oil contains oleic acid, which can have the effect of lowering cholesterol, and linoleic acid, which can help to prevent hardening of the veins. Rice bran oil has a good balance of oleic acid and linoleic acid. 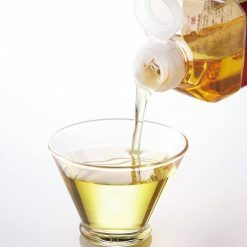 Unlike other vegetable oils, rice bran oil contains oryzanol; making it comparatively more stable in terms of heating and oxidation. This product also includes tiny quantities of nutrients found in rice (γーoryzanol, tocotrienols, tocopherols [vitamin E], etc). Seasonings such as oils can be a crucial part of a meal, turning plain food into a delicious experience. After all, sometimes we only think we don’t like certain foods because we haven’t tried them with the right seasoning! Sugarlady’s rice bran oil and other seasoning products are safe and free of chemical seasonings and additives, letting the true, natural flavors of the ingredients themselves shine – and allowing you to enjoy your meal without worry. Making fried foods and stir-fries at home rather than purchasing them at a restaurant allows you to control what goes into them, including the type of oil that is used. It also allows you to control the quantity of oil, so that you can avoid eating foods that are overly greasy or overcooked!Along with fried foods and stir-fries, our rice bran oil can also be used as seasoning in the day to day preparation of breakfasts and bento box lunches. This product contains rice bran cooking oil..